Be the first to share your favorite memory, photo or story of Wayne Douglas. This memorial page is dedicated for family, friends and future generations to celebrate the life of their loved one. 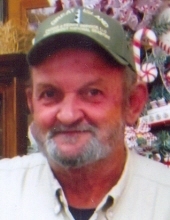 Wayne Douglas "Buster" Whaley, 67, of the Scott's Store community, Mount Olive, passed away suddenly and unexpectedly while at work Tuesday morning, November 20, 2018. The family will receive friends Friday, November 23, from 1 p.m. until 3 p.m., followed by funeral services at 3 p.m. in the chapel with the Rev. Jeff Bartlett officiating, followed by burial in Maplewood Cemetery. Family and friends are also being received at the residence. In lieu of flowers, memorial gifts may be made to St. Jude's Children's Hospital, 501 St. Jude Place, Memphis, Tenn. 38105, or American Heart Assoc. 3131 RDU Center Drive, Suite 100, Morrisville, NC 2756. Buster, as owner/operator of Whaley's Lawn Care, provided landscaping and mowing services for many lawns and gardens of various residences and businesses, and was caretaker of Mount Olive's town cemeteries. He was a founding member of Pleasant Grove Fire Department. Loved ones Buster leaves behind include his wife, Carol Jackson Whaley, of the home; a son and daughter-in-law, Doug and Pamela Whaley of Mount Olive; a daughter, Angie Whaley Burgess of Mount Olive, and son-in-law, Rich Burgess of Mount Olive; a sister, Glenda W. Herring of Mount Olive; six grandchildren, Cortney Kennedy and husband, Shawn, of Pink Hill, Carley Lee and husband, Nate, of Albertson, Matthew Burgess of Georgia, Makenzie Adams and Brandon Adams, both of Mount Olive, and Ashley McCaw of New Bern; great-grandchildren, Oaklyn Renee Kennedy, Jaelyn Hill, and Kelsie Hill; brother-in-law, Gerald Holland and friend, Nancy Lamm, both of Rocky Mount; sisters-in-law, Denise J. Keel of Pink Hill, Barbara J. Livingston of Faison, Lynette J. Matthis of Clinton, Debbie J. Tyre and husband, Danny, of Georgia, and Jackie J. Smith of Fla.; and several nieces and nephews. He was preceded in death by his parents, Raymond A. and Florence Taylor Whaley; a sister, Linda Whaley Holland; brothers-in-law, Billy D. Herring, C. T. Matthis, and Danny Keel; and his wife's parents, James and Jean Jackson. To send flowers or a remembrance gift to the family of Wayne Douglas "Buster" Whaley, please visit our Tribute Store. "Email Address" would like to share the life celebration of Wayne Douglas "Buster" Whaley. Click on the "link" to go to share a favorite memory or leave a condolence message for the family.